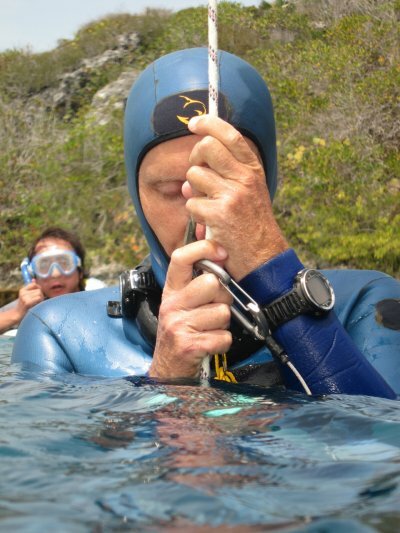 June 1, 2007 – William Winram as he is about to enter the Arch at a near 60 meters below the surface, facing another 30 meters of swimming at that depth through the naturally-occurring passage and, when on the other side of the Arch, another 60 meters to swim back to the surface. All this on a single breath of air, no fins, on his own power, breaststroke style. This was the first time this was ever attempted. DO NOT ATTEMPT THIS ON A WHIM. Years of training and preparation go into making a dive like this one. 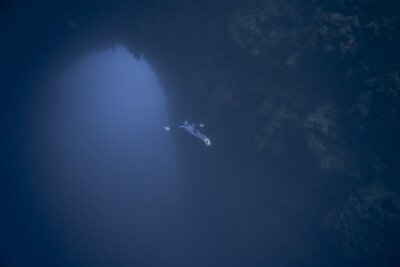 The photographer Fred Buyle is also on a breath-hold making this surely the deepest photo ever taken on a single breath of air. Type of record: NR (Canada), CR (North America), Pan-Am. Location: Montreal, CAN | AIDA Canada National Champ. Location: Renens, CHE | Pool WC – fin. heat op.